The format for this year’s tournament includes pool play for both the men’s and women’s divisions. With 14 teams, the men’s teams are seeded into four pools. The top two from each men’s pool will go through to an eight team knockout and the bottom six will go through to a tournament with two pools of three. In the women’s division, the number of participating teams has jumped from seven in 2017 to ten this year. The teams will compete in two pools before being seeded in the Cup, Plate and Trophy playoff divisions. Trinidad & Tobago Women’s Head Coach Carlton Felix acknowledged the growth of women’s rugby in the region as shown by the increase in participating teams this year. The number of men’s teams competing has also increased, from ten in 2017 to 14 this year. Last year’s men’s final in Mexico City saw Guyana narrowly lose to Jamaica, which denied them a ticket to this year’s Rugby World Cup Sevens. Guyana will surely have something to prove as will Mexico, Jamaica, and Trinidad & Tobago–the second through fourth places finishers respectively in the recent Central American and Caribbean Games in Barranquilla, Colombia. 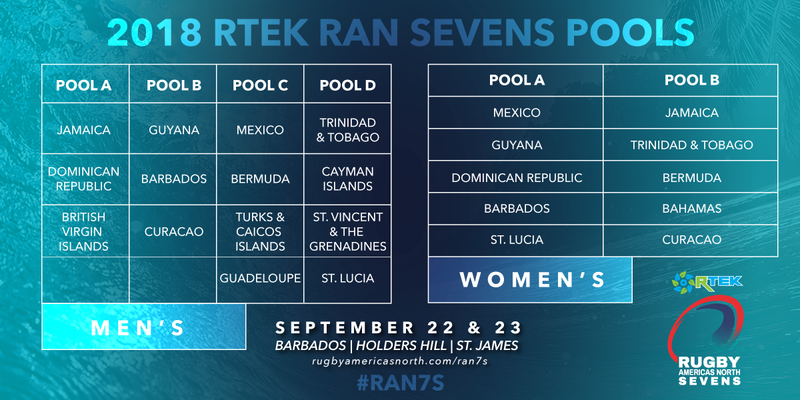 Barbados rugby union will also be hosting a fundraiser on September 16 as a kickoff to the 2018 RAN Sevens competition. This year’s legacy event is the Ultimate Tag Rugby Showdown–Celebrity Edition. Four teams of local celebrities will compete over the course of the day to help bring awareness to rugby in Barbados, promote the upcoming international competition, and build relationships with GIR Barbados and local sponsors. GIR Barbados is partnering with Bajan Rugby Pride, BSL Athletics, and Holetown Chamber of Trade to put on the event. All money raised will fund GIR and women’s programs in the union. All matches of the 2018 RAN Sevens tournament will be streamed live on RAN’s Youtube channel. Fans can also follow updates using the hashtag #RAN7s on Facebook and Twitter. The event page for the tournament can be found at www.rugbyamericasnorth.com/ran7s. All teams will complete their Pool matches on Day 2. The top 2 teams in each pool will play 2 matches on Day 1 and remaining match on Day 2 i.e. against each other.